Many people view trampolines with nostalgia, as a poster child for their childhood. Sure, they were fun to play on as kids, but trampolines also offer an entertaining exercise outlet for adults as well. Using a mini trampoline rebounder can be a refreshing, beneficial workout for adults. And it’s not necessary for them to take up loads of space, either. There are many models of mini trampolines, a formidable product being the Pure Fun Rebounder Mini Trampoline with H﻿﻿andrai﻿﻿l. This specific product has many alluring features. It is space-efficient, lightweight and can support up to 250 pounds. The trampoline itself has an exterior pad to protect against accidental injuries, an adjustable handrail and features a heavy-duty and sturdy jump mat. Aesthetically, the trampoline is pretty generic, with the standard black jump mat and blue exterior safety mat. There isn’t anything gorgeous about the design, but that may be for the best, in order to reduce distraction. After all, the trampoline is for exercise, not art. These established features do paint a great picture of the product and present an appeal to the prospective client. Looking past these specific features, it is also worth evaluating mini trampolines in general. For example, what are the benefits of using a rebounder mini trampoline? Are tramp﻿﻿olines a good workout? What are some effective exercises to do on a mini trampoline? Using mini trampolines for rebounding exercises actually has a multitude of health benefits. It is an amazing aerobic workout that yields a multitude of muscular and cardiovascular benefits. Certainly, trampolines such as the Pure Fun model are versatile; they can be utilized in numerous ways to fit the individual’s needs and personal desires. Although these mini trampolines offer diversity, they are best suited, naturally, for the training and strengthening of the core and leg muscle groups. Using these trampolines has been proven to be superior to jogging, which is a considerably more mainstream aerobic workout. Exercises on these rebounder trampolines are incredibly simple and may include: small bounces, large jumps, jogging and dancing. These examples are not all-inclusive, however. There are a variety of other, more creative workouts for these trampolines that can be tailored to personal needs. These workouts are easy to find and access, at the utilization of a quick internet search. The reviews on the trampoline are generally favorable. The average rating is 3.8 out of 5 stars. The majority of the buyer population commented that the product was favorably kid friendly. The product has also been said to be sturdy, portable and space-efficient. ​Those who review, claim that the trampoline is effective for small spaces and indoor exercise. Overall, the takeaway can be that kids and adults absolutely adore the trampoline for recreation and exercise. This is due to the raw sturdiness, enjoyable nature and convenience for places with restricted space. This seems to demonstrate that the properties of the product featured in the listing description are inherently true, making for a more trustworthy listing overall. However, 14 percent of the customer reviews give only one star. This is perplexing on first sight, as the product appears to be great. These reviews note, however, that the trampoline is not suitable for serious daily use. It seems that the trampoline, as one user wrote, is not built to last. Many reviews claim that the design just simply isn’t strong enough and will not function well in regards to regular use. In fact, many of the reviews claim, it will just break at the legs. This is blamed on ineffective welding. Having such a major constructive issue on such a crucial component of the product certainly doesn’t reflect well and can be a deal breaker. Another drawback to this product is that it seems the costumer service and the warranty are not great. In fact, many people have ventured to call the customer service poor. It seems that the company is unresponsive to complaints and doesn’t communicate effectively with its clients. A select few of the customers have described the warranty as “worthless” as they claimed they never heard back from Pure Fun. This is definitely alarming, being that those who did invest in the product weren’t assisted, despite there being a clear 90 day warranty. This lead to an overall decreased customer morale, perhaps deterring prospective clients from purchasing the mini trampoline. These deterred customers are not wrong, after all, no one wants to waste money on a faulty and ineffective product. 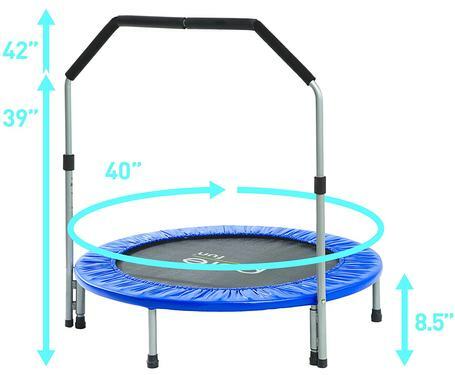 The Pure Fun 40-inch Mini Rebounder Trampoline with Adjustable Handrail has a legitimate appeal for children and adults looking for simple exercise. The majority of reviews are favorable, it comes with a warranty, is cost effective and saves indoor space. However, the reviews note that the product does not last long and that customer service was disappointing. This leaves the product as a considerable gamble to buy, as some reviews noted the trampoline to last years, while others just months. The company does seem to have a constructive issue to resolve in some of its models. In general, this product should not be labeled quality, despite its many benefits. There have been frequent customer complaints, naming the product unsatisfactory and the company itself intransigent in regards to aiding its clients with product malfunctions. It seems that the company has some serious improvement to do if it wants to grow its business and serve an overall higher quality product to its faithful clients. Read more here >> Also visit our mini trampoline for adults guide for more options.